Two photographs mounted on a pale pink foolscap card with handwritten annotations in blue ink below. Described from top to bottom, left to right. Top: Gwenda Elizabeth Donaldson (nee Laughton b. 1915 d. 2010) and Dorothy Violet Brown (nee Laughton b. 1918 d. 2016) stand in front of a plane at Archerfield airport in 1939 with a large woven basket held between them. 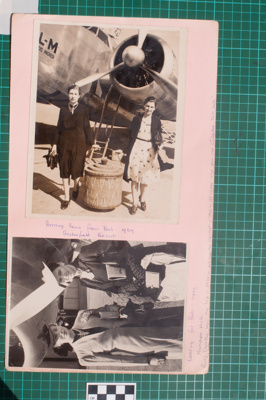 The image is described as "Arriving home from Bali 1939 Archerfield Airport". Dorothy (right) had won a trip to Bali with 50 pounds spending money after entering a competition to write a slogan for Colgate Toothpaste. Gwenda went as her guest and their experiences are described in Gwenda's autobiography entitled "The Family Story". The photo appeared in the Courier Mail and the basket was used as a dirty clothes basket. Bottom: Gwenda (left) and Dorothy (right) Laughton leaving for Bali in 1939, The descrpition reads: "Leaving for Bali - 1939. Newspaper photo. Aunty Dorothy won the trip - prize in a 6 months contest - 'say in 20 words why you use Colgates Toothpaste.'"